Squats - The Cave Hostels of Cappadocia, Turkey: There was a moment during last week's #TNI that caused me to do a double-take. The question was: "[What is the most] Ground-breaking hotel or hostel? Why?". The answer that caught my eye was from @LindsayTessis: "Loved the hostels in Cappadocia, Turkey - they're all built in caves! I mean, who doesn't want to sleep in a cave at least once?" I'm sorry, did she just say "cave hostel"? Now, I've stayed in caves before. Spain, America, Mexico... you got it. Love 'em. 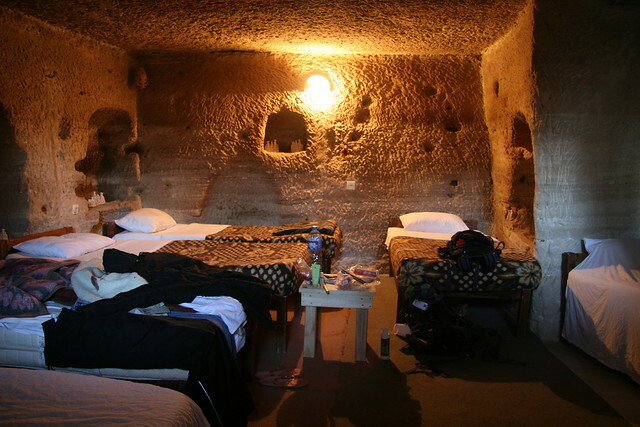 But an actual hostel built into a cave? I immediately checked into these magical little grottoes for travelers in more detail. After all, some places just throw around the word "hostel" without knowing what it actually means. Then I started seeing cave hostels popping up with things like "free internet" and "breakfast included" and I was sold. These. Caves. Are. AWESOME! I've already been jonesing to go to Turkey, and these cave hostels literally pepper the region of Cappadocia. Eight euros to stay in a cave with net-access in Turkey? I'm definitely landlocked on the wrong continent. The more I hear outta Turkey, the better it sounds. Seriously, Lindsay said it perfectly: "who doesn't want to sleep in a cave at least once?" There is a huge list of cave hostels [Here on HostelBookers]. Last week's #TNI centered on innovations in travel, easily making it my favorite "Travelers' Night In" so far. Check out the #TNI Roundup [Here on ZipSetGo]. If you've stayed in one or more of these, and have favorites or suggestions, leave a comment or send me a tweet. "May Angels Take You [Dying Vicariously]" by San Jaya PrimeDisclosure: This week's Song of the Day was produced by myself. Shhh... it's a secret.